We have lots of snow and it was minus 11. It must be time for something rich with lots of gravy, Slow Cooker Short Ribs. They have the advantage of making the beef, sauce and potatoes all in the slow cooker. I started by cutting 1.4 kg (3 lbs) short ribs into individual ribs. Then I chopped 150 ml (1 cup) of onions. I put the potatoes in the slow cooker. I browned the beef and put it on top of the potatoes. I sautéed the onions until golden and put them over the beef. I added 50 ml (1/4 cup) soy sauce, 15 ml (1 tbsp) Worcestershire sauce, 1 can condensed bouillon, 1 1/2 can water, and 1/2 can red wine. I put the lid on and cooked the beef for 9 hours on the low setting. I took the beef out of the crockpot with a slotted spoon and put it in a casserole. I took the potatoes out and put them in a casserole. I put both in a 180 F oven to keep warm. I strained the liquid and defatted it by putting it in a clear measure and using a turkey baster to pull the liquid from under the fat. I added the onions I strained out back to the sauce. I heated the sauce over medium heat until just boiling. I mixed 50 ml (1/4 cup) of cornstarch with an equal amount of cold water and added it to the sauce. I cooked and stirred until the sauce thickened. I served the beef, gravy and potatoes. The beef was fork tender, the potatoes have a great texture and the sauce is rich and beefy. What more could you want on a cold day! Cut the ribs into single ribs. Heat the oil over medium high heat and brown the ribs on all sides. Put the potatoes in the slow cooker. Put the beef on top of the potatoes. Sauté the onions until golden and spread over the meat. Add the soy sauce, Worcestershire sauce, bouillon, water and wine. Cook at low for 9 hours. Remove the beef to a casserole with a slotted spoon. Remove the potatoes to a casserole with a slotted spoon. Put the potatoes and meat in a 180 F oven to keep warm. Strain the liquid in the slow cooker. Defat the liquid by putting it in a clear measure and using a turkey baster to pull the liquid from under the fat. Add the onions that were strained off back to the liquid. Heat the liquid over medium heat until just boiling. Mix the cornstarch and cold water. Add it to the sauce, cook and stir until the sauce is thickened. 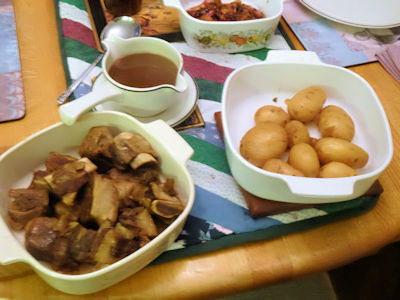 Serve the sauce in a gravy boat with the potatoes and meat. I’m sure my autograph will be worth something some day. Maybe a nickel if it comes with a dime! I’m liking the outdoor introduction in the video. It’s a nice touch to put Passing Wind Estates into context for the viewer.